It’s a little bit like peanut butter and chocolate, salt and pepper, or maybe even Oreos and cold milk; two individual items that are well enough on their own but when put together they become the ultimate compliment of one another. Individually, music and video games share a ton of similarities: many are passionate works of art, they have die-hard fans, and, from a cultural standpoint, both have transformed into art forms that define the different generations. It was only a matter of time before the two melded together, and the truth is it actually has been happening a lot longer than most gamers realize. The relationship between music and games goes back a lot further than the recent Rock Band and Guitar Hero series. Although the most recent collaborations are arguably the most successful that either industry has seen, they are merely the latest trend in a collaboration that has been in existence for more than 3 decades. As early as the late 1970s, the two forms of art were combining to enhance one another on both sides of the fence. Bands such as KISS were quick to lend their likenesses to pinball machines among other music groups, and full blown music themed video games became common place when the home market took off in the early 1980s on nearly every platform imaginable. If you have ever wondered just how deep the relationship between music and games has gone, Scott Steinberg has the perfect book for you. Beginning today, Music Games Rock - a compendium of nearly every instance of music and games meeting one another - is available to shed a little more light on a relationship that is both older and stronger than most of us even realize. 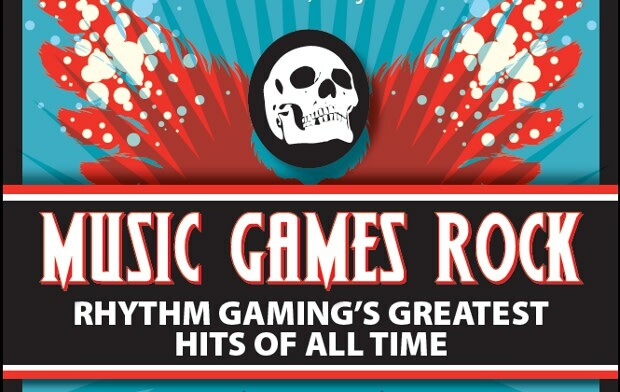 If you are even slightly interested in the music-game genre, Music Games Rock is a must-own. The book is available free of charge as a digital download from the official website MusicGamesrock.com as well as digital and paperback book versions on Amazon, the iTunes store, and Lulu for $2.99 and $24.95, respectively. Featuring a forward by Harmonix co-founder and CEO Alex Rigopulos, Music Games Rock will teach even the most knowledgeable gamer a thing or two about nearly every time the two have crossed paths. It is more than just an A-to-Z listing, too, as Steinberg digs deep into topics such as the weirdest music games that have ever existed, the oddest cameos both industries have seen, and even a look at the various peripherals that the collaborations have spawned. This may be the definitive encyclopedia for the genre as it has earned a permanent spot on my bookshelf for reference and entertainment purposes. As informative as the title is, it also serves as unmitigated proof that Steinberg knows and loves music games; this book comes from the heart. Music Games Rock is a win/win regardless, be it from an entertainment or an educational perspective. We got a chance to briefly speak with Scott recently and pick his brain regarding his motivations behind writing the book and his thoughts on the relationship between gaming and music as whole. Complex: What makes the music-game genre significant compared to other gaming genres? Scott Steinberg: Music games are significant because, moreso than any other type of video game in existence, they have the power to speak to every human being on this planet, and bridge the gap between age, gender, background, religion and ethnicity. Because the love of music is hardwired into every man, woman or child, we&apos;re not just preprogrammed from birth to be more receptive to them… they also provide a perfect vehicle for social interaction and wish fulfillment. Name one person who&apos;s never sung along with the radio, or dreamed it was themselves up on-stage rocking the crowd. Now ask yourself: How many kids grow up wanting to be an overweight plumber crawling through sewer pipes stomping on flying turtles, or, for that matter, an angry bird? &apos;Nuff said. Based on everything that you have learned in your research, where do you think music games will go from here? Mobile, social, digital and online connected-play are the future of music games: You can already see it happening in the rise of franchises like Tap Tap Revenge and gamification-powered group listening services like Turntable.FM. Free and low-price titles which tap into your smartphone and tablet PC&apos;s digital music library (i.e. via iTunes) and/or allow you to download tracks on-demand are already rocketing up the charts as well, while others like Say What?! and Skillz are offering novel approaches to discovering and interacting with new tunes and genres, or providing similar experiences to those traditional consoles do at a fraction of the cost and without the huge honking $120 controllers, respectively. Billions of people are suddenly now walking around with readymade jukeboxes in their pocket in the form of digital devices, while hundreds of millions worldwide are also piped into free multiplayer networks courtesy of social networks like Facebook - given music&apos;s massive appeal, and growing ubiquity, expect to see game makers finding ever more intriguing ways to build play around it going forward. Guitar Hero&apos;s great for anyone who wants to be Joe Satriani. Rock Band&apos;s for people who get high on wowing capacity crowds or nostalgic parents and working professionals that dream of getting the band back together. Me? I&apos;m a fence sitter: I can&apos;t play anything that involves actual rhythm and hand-eye coordination to save my life, but if there&apos;s a microphone attached, and cold beverage in hand, brother… you&apos;d better pray you brought your earplugs. The music-game genre has gone through a variety of changes in the past couple of years; some have called it the death of the genre, others call it the evolution. How do you describe what we have seen? Music games peaked at 1.7 billion in 2008, but crashed hard to the tune of a 46% sales drop just one year later, leading Activision to temporarily shutter the Guitar Hero franchise, MTV to sell off Rock Band creator Harmonix (also the developer originally responsible for Guitar Hero - it&apos;s a small world) and critics to label the genre "dead." But what naysayers miss is that music games have been a part of the interactive canon since day one, before the Atari 2600 emerged from the primordial ooze even, and it&apos;s not music gaming that&apos;s dying… rather just the market for pricey plastic instrument based performance simulations that&apos;s contracting, as there&apos;s little value in paying $100+ for expensive plastic peripherals year in and out when most titles let you simply download new songs that keep them feeling fresh and new for pennies on the dollar anyway. Look at dancing titles like Dance Central 2, Just Dance 3 and Michael Jackson: The Experience: New motion control systems like Move and Kinect, coupled with the Wii&apos;s massive following, are helping propel all to chart-topping success. Downloadable offerings for smartphones and tablet PCs such as Tap Tap Glee, Say What?! and Skillz, plus apps such as VidRhythm, Songify and Cambox are also growing in popularity. Hell, a million people still login online each month to grab new tracks for Rock Band, which has sold over 100 million digital singles. It&apos;s safe to say that the field&apos;s damn near got more lives than Keith Richards at this point. Can you give us a couple of examples of some of the strangest or weirdest titles or collaborations that you have run across in your research? From full-blown gaming forays by Devo, Prince and Peter Gabriel to text adventures featuring The Beatles; random cameos by Phil Collins and Coolio; and tales of multimillion dollar excess as record labels decadently funneled piles of cash into games which glorify pimping, doing smack and shagging groupies (which quickly turned into the interactive equivalent of Guns &apos;N Roses Chinese Democracy), the book presents a mix of the weird, wild and WTF were they thinking. Let&apos;s just say that, like the music industry itself, the music gaming field has no shortage of interesting characters, or stories to tell. Do yourself a favor and check out Music Games Rock, which is now available.